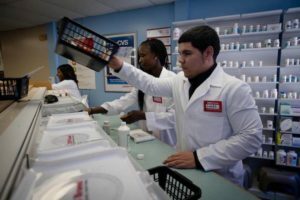 Pharm Tech Schooling » Blog » What Kind of Salary Can You Expect as a Pharmacy Technician? A pharmacy technician works with a pharmacist the same way a nurse will work with a doctor. They are in charge of several responsibilities in the pharmacy like the preparation and administration of drugs, preparation of IV admixtures, assisting the pharmacist, doing clerical work like medical inventory, filling and filing of prescriptions, and so on. As a pharmacy technician’s duties increase, so does the stress that’s piled on top of his/her career. Medication and patient counseling is also done by a pharmacy technician whenever a patient is taking his or her medications the wrong way. While a pharmacist is able to carry out most of these tasks, he or she is far too busy with other tasks so a pharmacy technician is their assistant, so to speak. With the growing number of patients exponentially contributing to the growth of the medical field and the demand for medical and pharmaceutical technologies, the demand for pharmacy technicians will also grow by as much as 16% by the year 2016. But with the demand for a pharmacy technician, is it safe to assume that they are paid the right amount of money for their tireless duties? Despite the economic woes faced by a lot of countries all over the world, the healthcare industry continues to be the fastest growing industry in the world. There is an estimated 3 million jobs that will be created by the healthcare industry within the next 10 years according to the US Department of Labor. Pharmacy technician is one of those predicted career paths that’s going to be promising and stable as the healthcare industry continues to grow due to its excellent and very competitive pay. On average, the starting pharmacy technician salary is at $19,000 a year and this is just for entry-level pharmacy technicians. Like most jobs in any industry, the starting pharmacy technician salary may be considered as low but we all know that this is not permanent. As a pharmacy technician gains more experience, more skills, and more certifications, his salary range will widen. He or she will enjoy benefits that will not be offered to him at the start of his career. It also depends on the institution where the pharmacy technician is working. One common benefit that’s usually offered to a pharmacy technician here in the USA is a 401K retirement plan. Another benefit that usually entails with the job is a discount at the institution where the pharmacy technician is working. Family discounts are also offered to the immediate members of the pharmacy technician, so if he or she is working at a hospital, the family members can enjoy reduced costs in medications or admission fees. As a pharmacy technician, part of your job responsibility to get a higher salary or pay grade is to get more out of your education. To encourage pharmacy technicians to proceed with their continuing education, the PTCB or Pharmacy Technician Certification Board requires all certified technicians who will renew their license to proceed with a 20-hour continuing education program in their respective colleges or institutions. It has also been observed that some doctors and nurses are taking up short-term pharmacy technician courses as a means to enhance their skills in the field of medicine. As a pharmacy technician, your skills will play a role in how much your salary will be. There are several factors that can play a huge role on how much your pharmacy technician salary will be. Education and experience happen to be two of the biggest factors for two reasons. One, experience will help build skills and will affect your overall education as a pharmacy technician. education is a big factor because it also matters where you got your degree from and what certifications you hold to certify that you really know your stuff. Experience will also help increase your pharmacy technician salary range by a few thousand dollars a year because your employers will see it as an important and valuable asset. They won’t feel the need to orient you with the way things are done in the pharmacy or in any institution because you already know what to do. In the USA and Canada, pharmacy technicians in the retail business usually get paid less than pharmacy technicians working inside hospitals. At best, the starting salary for a pharmacy technician in retail can go for as low as minimum wage or slightly higher. Entry level jobs that require no formal education are usually found in retail, so don’t expect too much out of this. From there, a pharmacy technician can choose to get higher salaries by acquiring higher responsibilities, but in order for them to do so, they need to have the right skills and training. For starters, hospitals are known to pay higher salaries to technicians who know how to prepare IV admixtures. This is because specialized training is involved in IV admixtures due to its nature of being intravenous, or it passes through the veins. Technicians who know how to prepare cancer-related medications are also given higher salaries than those who don’t. According to more recent surveys, the salary ranges for pharmacy technicians is between $20,000 and $40,000 a year after a few years of working in the industry as a technician. Some statistics show that the CPhT salary ranges between $23,000 and $36,000. The highest paid pharmacy technicians usually belong in military-run facilities. In the United Kingdom, their certifications for pharmacy technicians require certain levels of education that’s needed for the position. A pharmacy technician needs to have good grades in minor subjects like Math and English, as both are critical for the major subjects in the pharmacy technician courses. It is also important to note that pharmacy technicians are not the same as pharmacy dispensers. Technicians with no specialty will receive salaries of up to £16,000 and £20,000 annually while higher positions will have salaries that go as high as £37,000 annually. Both pharmacy technicians in the UK and USA will be able to acquire the lowest salaries possible in a retail setting and the highest salaries possible are in the military. Like most jobs in the healthcare industry, your salary is dependent on your experience and education, as what was mentioned earlier. Nurses who are more educated and more experienced are more likely to get promoted to managerial or supervisorial positions. Pharmacy technicians are not exempted from this idea, so it pays to be equipped with skills necessary for growth and career promotion. One good example is when you are trained in the preparation for IV admixtures and cancer medications. These are beyond the realm of non-specialized technicians, so it pays to be certified in skills like these. Depending on your school, you will be asked to enrol in a practicum or internship where you will be put to the test. You will be working in a setting of your choosing for a set period of time, like 200 to 300 hours, so you will have an idea of what it’s like to be a pharmacy technician even as a student. The internship hours are also part of your requirement for certification, depending on what state you’re in. When it comes to education, you can’t expect higher salaries if you only graduated from certificate courses, as they offer no real qualification and they only cover a basic overview of the job. College degrees and diplomas, as well as specialized education, are what you need to enjoy higher salaries in this field. From the get-go, you will be offered a higher starting salary than someone who’s graduated from a certificate course. The more you know the moment you graduate, the higher the chances of enjoying a higher salary. Promotion also becomes more of a possibility when you are equipped with a diploma or a college degree. If you have no idea as to what it’s like to work in the healthcare industry, the career of pharmacy technician can offer a keen insight. Due to its service-oriented approach, your job as a pharmacy technician is geared towards assistance. You will assist pharmacists, doctors, nurses, and even patients when it comes to their medications. But how valuable is your opinion? It’s valuable to the point that the doctor or nurse will not hesitate to administer the medicine to their patients because part of your job is to know the exact dosage. The moment they receive your medicines, they will not check it again. It’s all on you. Due to the fact that more people are getting sick, the demand for medicinal technologies has gone through the roof. The need for better medicines, better treatments, and better specialists continues to skyrocket as people are admitted to the hospital every day. Doctors and nurses can no longer do it alone, and pharmacists need all the help they can get. This is a scenario that the healthcare industry is faced with today. Hospitals and clinics from all over the world are at the mercy of their patients and employees can only do so much. Different economists have predicted that due to this demand, more pharmacies will be sprouting up like mushrooms after the rain. When more pharmacies open, more manpower is required to man these outlets. Apart from the need to get better, people are also demanding more ways to stay healthier. The demand for this kind of technology will require specialized manpower, like pharmacy technicians working in pharmaceutical companies. As the demand for jobs increase, it’s going to be more difficult to attract the right people, so having good salaries is a plus. Pharmaceutical companies and other settings will go as far as compete when it comes to providing salaries to pharmacy technicians just so they will get to hire the person. A pharmacy technician makes an hourly salary wage of $8 to $13, but economists are predicting that the hourly rate will double within the next few years. They can also predict that the hourly rate may go as low as $18 per hour. But just because you’re a pharmacy technician doesn’t mean that you will get the $18 per hour. As mentioned earlier, experience and education play a huge role. If you only completed a certificate course, don’t expect a good salary. At best, you will enjoy minimum wage. But if you’re able to enrol in specialized courses, like getting a college degree, the chances of you getting a higher salary increases. If you have a graduate degree in anything related to pharmacology, you will be getting salaries that won’t be lesser than $40,000 a year. The career of pharmacy technician doesn’t really differ that much from all the other professions in other industries. A banker has a higher salary if he has an MBA. An architect has a higher salary if he has a good license and some certifications. The same thing can be said to the pharmacy technicians. Non-specialized technicians will have salaries that belong in entry-level, but specialized technicians have the chance to enjoy a pay grade that’s usually enjoyed by managers and supervisors. It also depends on where you are going to be working as a pharmacy technician. you won’t be able to enjoy a higher salary if you’re going to be in retail, or a pharmacy that’s outside the hospital. This is due to the fact that pharmacies in retail settings have a hard time competing with pharmacies that are located inside the hospitals. If you’re a pharmacy technician in the hospital, you will be able to get a decent salary simply because of the working environment. From time to time, you will go on overtime to keep up with the demand for medications in the hospital or if manpower is lacking. If you really want to get the highest salaries possible, then you may want to work in a laboratory setting. Pharmaceutical labs are after pharmacy technicians who know how to prepare specialized medications.